This is the new U-BOAT Doppiotempo Bronzo BR Ref. 9008 / GR Ref. 9088, the latest creation by Italo Fontana, with a 46mm bronze case and a bi-directional rotating bezel, it features an additional hand allowing you to gauge the time in two different time zones. 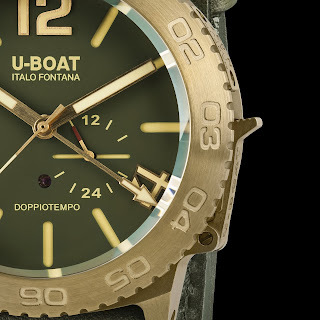 The case of the Doppiotempo has been made of naturally aged bronze (so no forced patina). 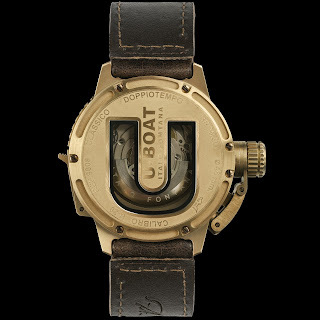 It has a water-resistance of 100 meters and is fitted with U-BOAT’s patented protective device, a crown release system on its left side at 8 o’clock AKA canteen-style crown cover. 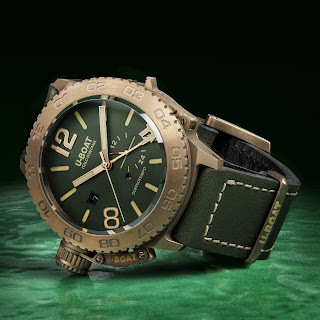 Over on the other side of the case is a bezel locking lever plus a serial number engraved on a small plate that is fixed on the case just above it. It is also equipped with a Sapphire crystal with anti-reflective treatment. The watch face is made up of three superimposed brown or green dials with a visible ruby poking cheekily through at 6 o'clock. 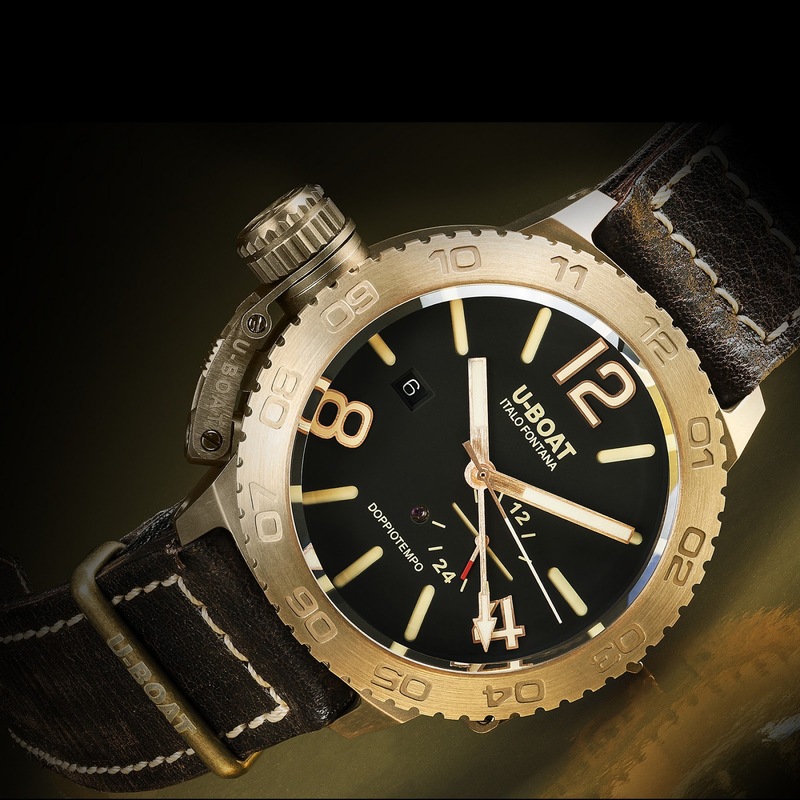 It features Arabic numerals, with a bronzed brushed frame and SLN treatment and hand-brushed bronzed hands, also with SLN. 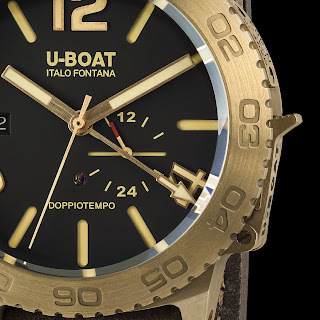 Power comes from a 25 jewel, automatic mechanical movement, personalized to U-BOAT specifications so that the stem could be positioned at 9 o’clock. 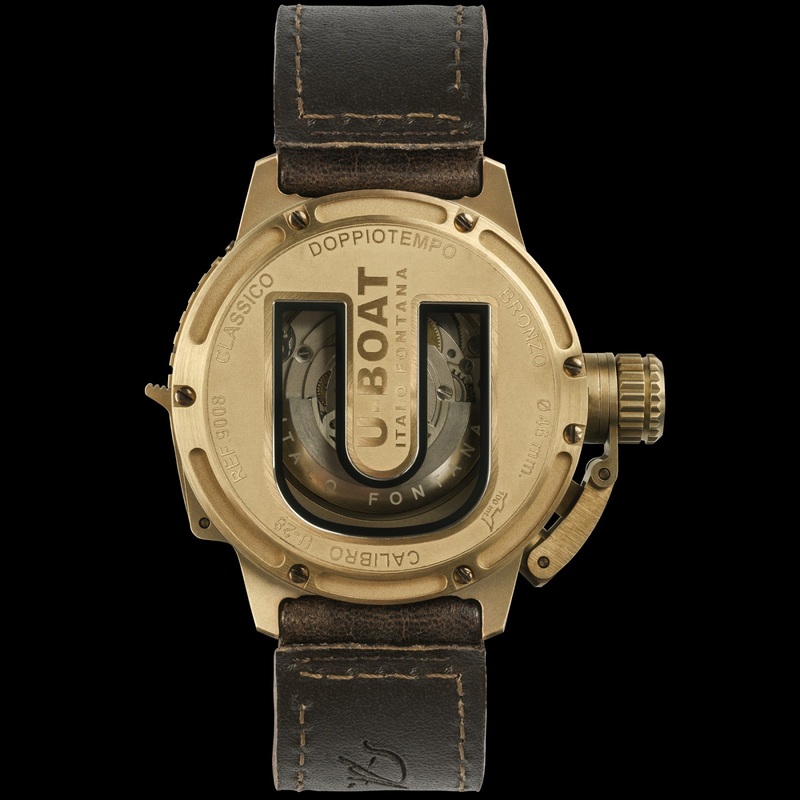 It has a laser cut rotor as per U-BOAT specifications, a frequency of 28,800 vibrations per hour, 4 Hz and a power-reserve of 38 hours. 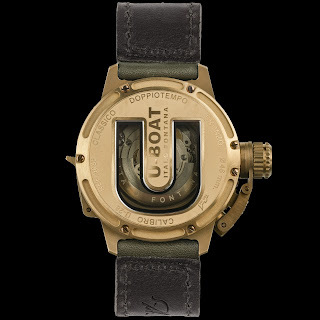 The case-back is kinda’ cool – it is sealed with 7 external screws and has a small U-shaped window with fumé (smoked) Sapphire crystal showing the balance wheel movement. 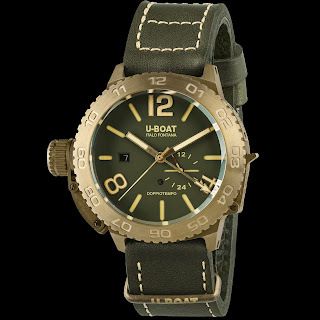 Finally, the new U-BOAT Doppiotempo Bronzo comes on a handmade, hand finished 22mm calf leather strap in brown or green with tongue buckle in bronze – priced 3300euro. BTW Ref. BR is currently SOLD OUT. Am I being dyslexia again or did anyone else see the word, disappointment on first glance? 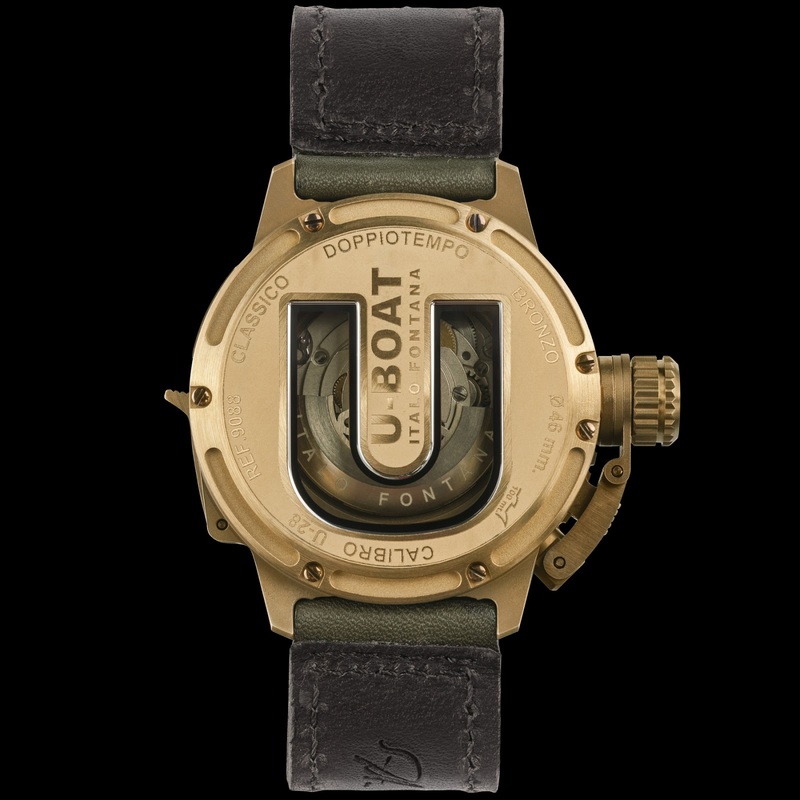 For reference, I believe doppio tempo translates as double time from Italian. So what do you think? Is this something you’d buy? 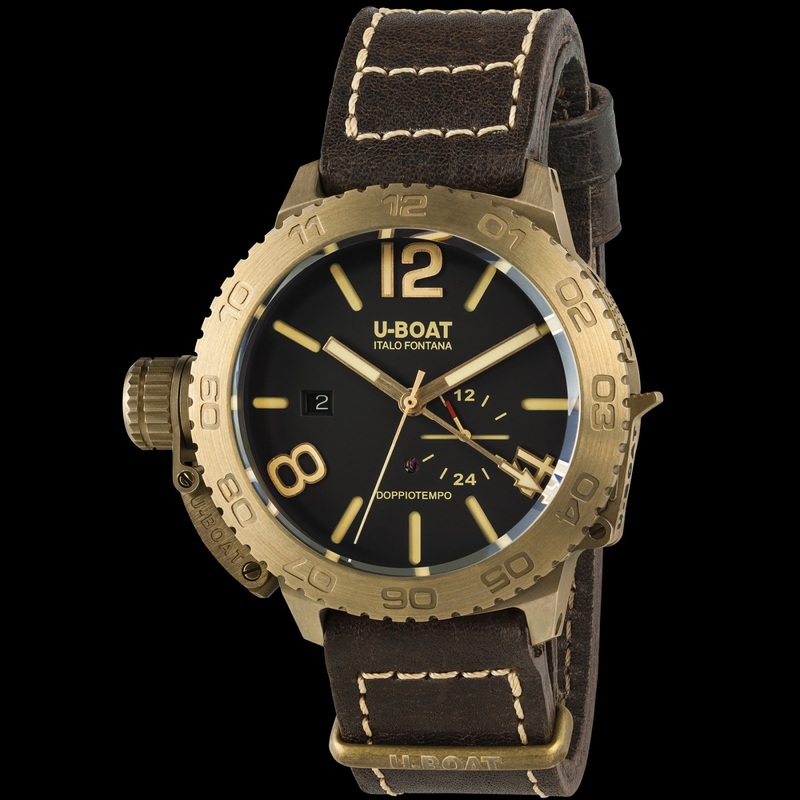 How about U-BOAT’s image – would you consider them a fashion brand still? And what about canteen crown covers – love ‘em or hate ‘em?